Virtually every part of society, including the fitness world, has taken advantage of the convenience of technology. Rather than trying to figure out a workout plan, build muscle, and develop overall well-being on your own, there are endless online resources available to lead you. With technology, improving your lifestyle becomes a bit easier. It still involves work, effort, and sacrifice, but at least you have a program guiding you along the way. Some sites require a payment to have access to their programs, and others are completely free. Online home workout programs can take your fitness level to the next level and you don’t even need to leave the comfort of your home. All you have to do is take the initiative, do a quick search, and find a program that fits your budget, time, and body. Thrive90 Fitness, a program designed by FitMarriage, will not only meet these standards, but is even geared towards improving the relationship between you and your significant other by creating workouts that allow couples to work out together. Every program is going to have its own unique aspects, but they will all be based on the same foundation: gaining strength, burning fat, and toning the body. Exercise is the best medicine that you can provide for your body. Any increase in the amount of exercise that you do will have a positive effect on mood and health. It also has countless benefits that many people are not aware of, such as preventing breast and colon cancer and reversing the effects of depression. Of course, it undoubtedly helps with slimming down and toning muscles. If you’re totally new to daily exercise or strength training, it’s important to keep in mind that a healthy exercise doesn’t require an intense training plan, but it does necessitate some consistency and dedication. Before starting any workout program, check with your physician to ensure that you’re making a safe decision. Many people believe that aggressive workouts will have an immediate impact, but in reality, if you start out too fast, you may get burnt out or injured. 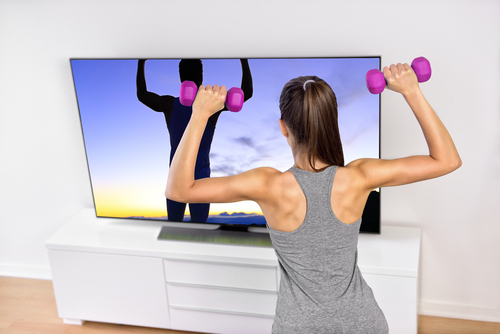 Thrive90 provides 15 full-length, high-definition workout videos (plus a few extra) that will not only get you in shape, but even better, allow you to work at your own pace in a comfortable environment. Remember, start low and go slow. Another important point to consider when exercising is finding activities that you ENJOY doing. Exercise does not have to be dreadful, though some days may take a little bit more motivation than others. There are so many kinds of workouts to take advantage of: yoga, Pilates, running, walking, spinning, Zumba, HIIT, swimming, etc. Thrive90 gives its users plenty of options. You can choose from core, strength, circuits, interval, cardio, and power yoga workouts. It’s always possible to modify or use the workouts as a foundation and then get creative and change things up! The program provides 12 weeks of three separate phases of workouts that continuously challenge the body. The exercises are also designed to do solo or you’re your partner. So many options to choose from! Quite a popular excuse for many people when it comes to working out is that they don’t have enough time in the day. Thrive90 solves that problem. Promising to only take a maximum of 30 minutes of your time, Thrive90 will get your blood moving and sweat flowing in no time. Most of the workouts don’t even take more than 20 minutes, so you can’t use the time excuse. Hopefully, with our unique workouts, you will see and feel quick results and stay enthusiastic with the fun exercises. Obviously, setting aside time in your day looks different for each person. A few suggestions that we have may be waking up 30-45 minutes earlier in the morning, doing a workout over lunch, or even going for a walk or jog while your kids are at practice. Since our plans are designed to include your partner, having someone to get up with in the morning can be incredibly motivating. Maybe you don’t have the extra money to spend on a gym membership each month. Since you can do our workouts at your house, you don’t need to hire a babysitter. Simply pay for the workout program (it’s a one-time payment) and then work through the videos on your own. A few other perks to take notice of are the accessibility of taking your workouts with you wherever you go. All of the files are downloadable, so you will never lack a workout program! We offer a workout calendar, which will assist you in tracking your progress every step of the way. Have you ever taken a fitness test? No, it doesn’t sound fun, but the Thrive90 Fitness test lets you see your progress and celebrate your accomplishments. Proper nutrition isn’t always easy to figure out on your own, so we provide a guide and suggestions on how to focus in on eating right. Finally, we emphasize goal-setting and send out weekly emails to keep you informed and pump up the motivation levels. Our program will help lead you to the body, fitness level, and all-around success that you’re looking for. With workout videos, a nutrition guide, and several other benefits, you will be on the right path in no time. Not only will your confidence levels increase, but you’ll feel great in many ways! Take the next step towards improving your health and check out our unique online home workout program today.